When most people think of coins, they think of them as collectible items. Sure they think of the coins as having value, but they primarily think of them as a hobbyist pursuit. However, coins can actually be a serious investing option. In fact, serious investors know that coins are a smart choice for a stable financial future. Whether you are starting to invest or you are looking to diversify your investment portfolio, you should consider visiting a coin shop to buy Arizona silver and buy Arizona gold. If you live in Glendale, Arizona, Arrowhead Coin & Jewelry has the solutions you need. All coins are printed with a value. For example, a quarter is printed with a value of 25 cents. However, with collectible and bullion coins, the printed value is not necessarily the actual value of the coin. A quarter could actually be worth hundreds of dollars, and a dollar coin could actually be worth a few cents. Many things go into determining the actual value of a coin. Most notable is the metal content of the coin. A gold coin will be valued by how much gold is in the coin, for example. Yet the weight of the gold or the silver is not the only thing used to determine a coin’s value. Also important are the condition of the coin, the year, the scarcity, and so on. The most valuable bullion and coins are gold and silver. Gold typically has the highest value, and it is historically a more stable investment. Silver is more affordable, but it is still a good option for investors as it is widely available and more attainable for first-time investors. It is important to consider current values and recent market trends before purchasing a specific type of coin. Just like with any market, there are fluctuations. You want to buy when prices are low and poised to go back up again. One major reason that investors like the buy silver and gold for their portfolios is that these coins are very stable. They are tangible goods rather than abstract concepts. Therefore, if there is a financial collapse and the value of money plummets and the stock market nosedives, those coins will still retain value. By stocking your investment portfolio with coins and bullion, you can make it more stable even in times of crisis. 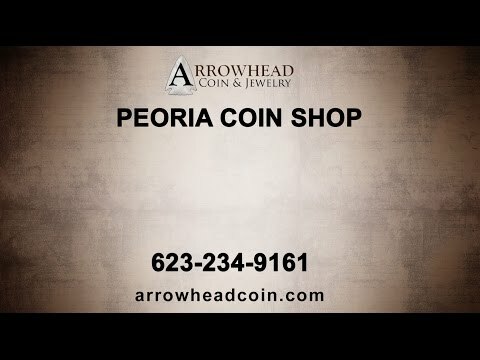 Arrowhead Coin & Jewelry sells a variety of gold and silver bullion and coins for investors in Peoria, Arizona and the surrounding area. We are the premier Peoria coin shop in the area, and we routinely buy silver and gold so we always have the options you need at competitive prices. We don’t just carry collectible coins. We carry valuable investments that can help you stabilize your financial future. Stop in to our top-rated Arizona coin shop today to buy bullion coins to fill out your Glendale portfolio. Contact us today for more information.